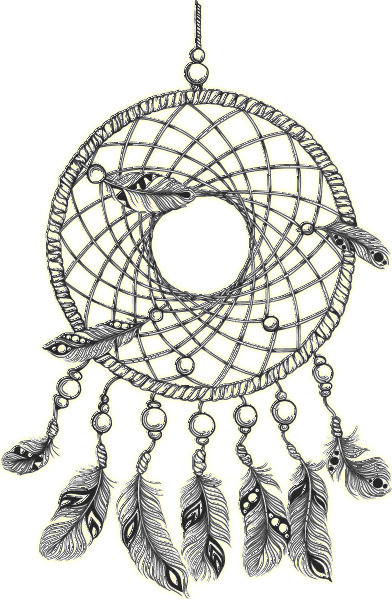 Dreamcatchers are amulets made by the native american sioux people to protect the dreams of their children. Their designs have captured the imaginations of humans for centuries. They are supposed to protect from the evil forces and keep them away. Those small wooden circles look like a spider web that was generally hang on top of the children beds to catch the bad dreams and allow them to sleep well favoring the flow of the good dreams through the hole in the center of the net. According to the legend any evil thing may be captured in the web. The original and more antiques descriptions of the Dreamcatcher describe the amulet as a three concentric circles device with eight nodes each and a web that join them and then a little hole in the middle. The number of nodes may refer to the same number of legs a spider has. That specific animal represented like and antique native american spirit wove the net. You can see references to this legend everywhere, look at the mirrors of the cars on the road or in any parking lot and you will see the dreamcatchers hanging there, there are also beautiful tattoos designs and obviously they are present in different movies and tv serials. Legend or real magic? It is a beautiful part of the history but there is something else about the Dreamcatcher that you do not know. The DreamTimer is presented in our network as a stopwatch 24 hours based = 3 * 8. It measures time availables in different competitions among the dreamers.